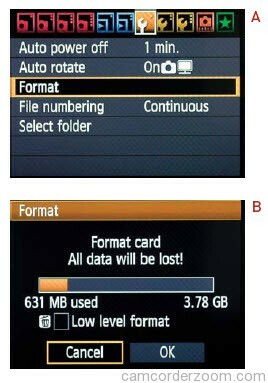 The first thing to do when you have a new SD card is format it. When you format a card, the camera creates a layout for the images to be written more easily and saved properly. Formatting also “cleans” your card, making it a blank slate to write new images to, and is the recommended way of deleting data from the card. You should always format the card within the camera itself, because formatting it from the computer could render the card useless. You also want to be certain that your images and files on the card have been safely transferred over to another source before formatting your card. I try to reformat my card before each use and after I have uploaded the images to my hard drive. I also format my card if it’s brand-new or has been used in a different camera. I like to start with a fresh card each time I shoot to simplify my workflow when I’m taking a lot of photos, so I can keep them organized and separated from my other images. Insert the memory card into your camera. Press the Menu button, and navigate to the first setup menu tab (the fifth from the right). Rotate the Quick Control dial on the back of the camera to highlight the Format option, and press Set (A). The default selection for the Format screen is Cancel, just in case you didn’t really want to format the card (B). Turn the Quick Control dial to highlight OK. The screen will warn you that you will lose all data by formatting your card, so make sure that you have saved any images that you want onto your computer or elsewhere before formatting. Press the Set button to finalize the formatting of the card. directory so that you can write over the existing data. It’s a good idea to use this feature whenever you are discarding your SD card to prevent anyone from recovering data that may still be remaining on the card.